When a brother and sister chase after their missing dog, they stray into the field they were told never to go into. Before it’s too late, their father catches them and tells them the frightening story of the witch’s child. 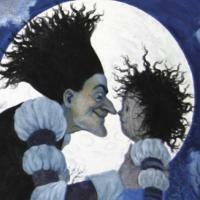 Based on the critically acclaimed picture book by Arthur Yorinks, The Witch’s Child will let your imagination run wild. With music, projections and sound effects, this charming and spooky audio play for family audiences (children ages 6 and up), is a perfect beginning to Halloween. Come in costume to celebrate Halloween in the hauntingly fun Greene Space–with face painting, fortune-telling, book-signing and more!